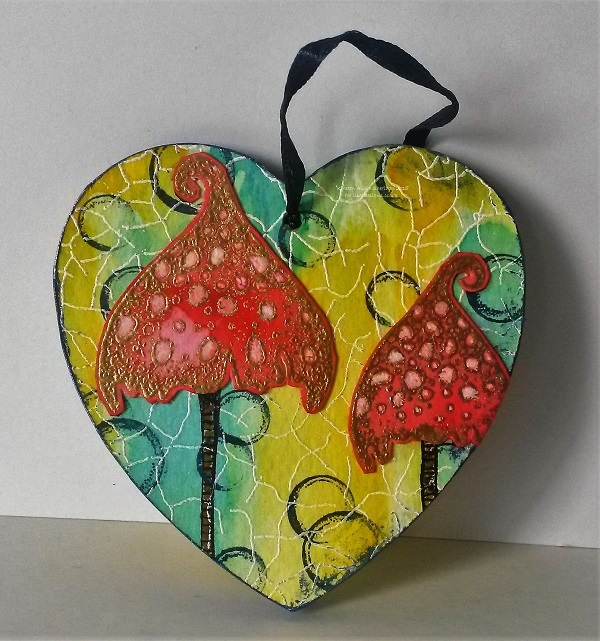 I stamped the Spotty Toadstools onto the piece of red card with Versamark ink & heat embossed with gold embossing powder. I cut them out & glued them to the heart. 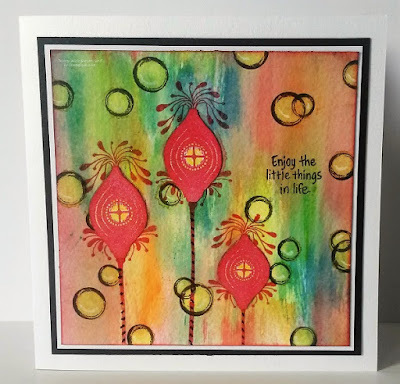 Thanks for all the kind words about our Lavinia Stamps & Brusho projects this month, there are still a few more to come before the end of the week. The Lavinia Stamps blog challenge runs until Saturday night, so there's still time to get your entries in. 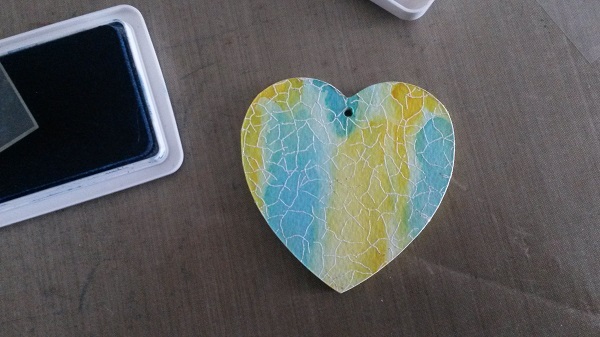 The September classes are this coming Friday, you can get the information in this blog post & on the Lisa B Designs Facebook page - look for the Events section. There are a few places left, email Lisa - lisabaker1@btinternet.com - to book yours. Sorry it's a quick post this week, I've been away on business for a couple of days. So I took one of the lovely wooden mirrors (they don't seem to be on the website at the moment) and masked the mirror section with tape. Then painted the wood with white Gesso. It didn't take very long to dry but I did use my heat gun to help it along. 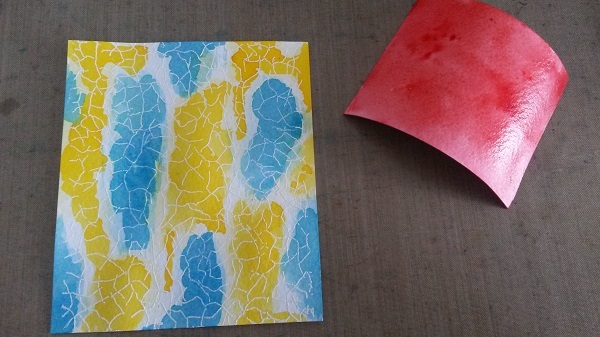 I then made myself a couple of hills and valleys by tearing paper and used the brayer to spread some light blue acrylic paint ensuring it was dry after each coat. As you can see the colour graduates up and lightens. I then took one of the Creative Expressions Smoothies to dab on some Stonewash distress ink to darken the edges of the frame. 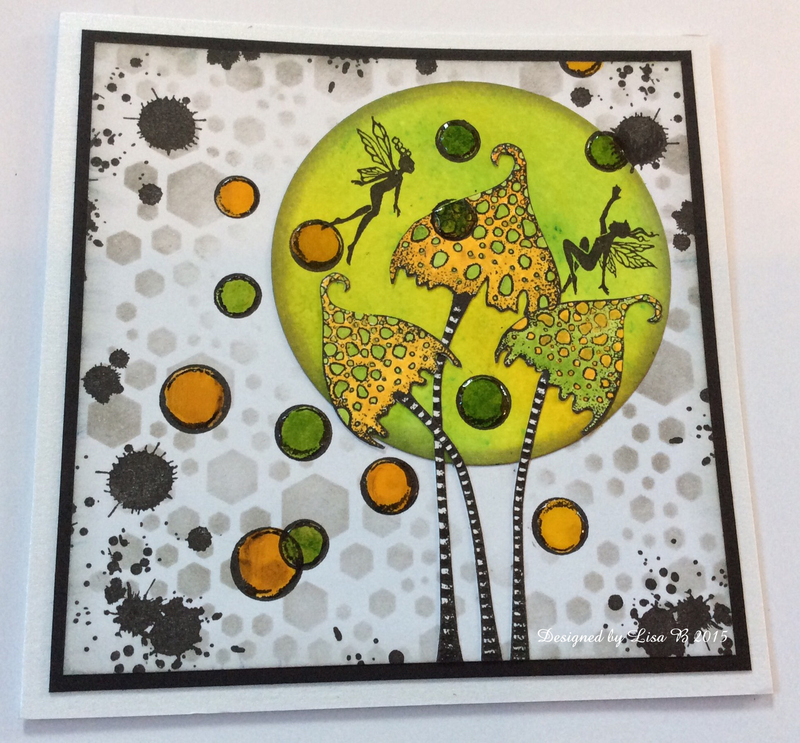 I used the following Lavinia stamps and Versafine and stamped my images. 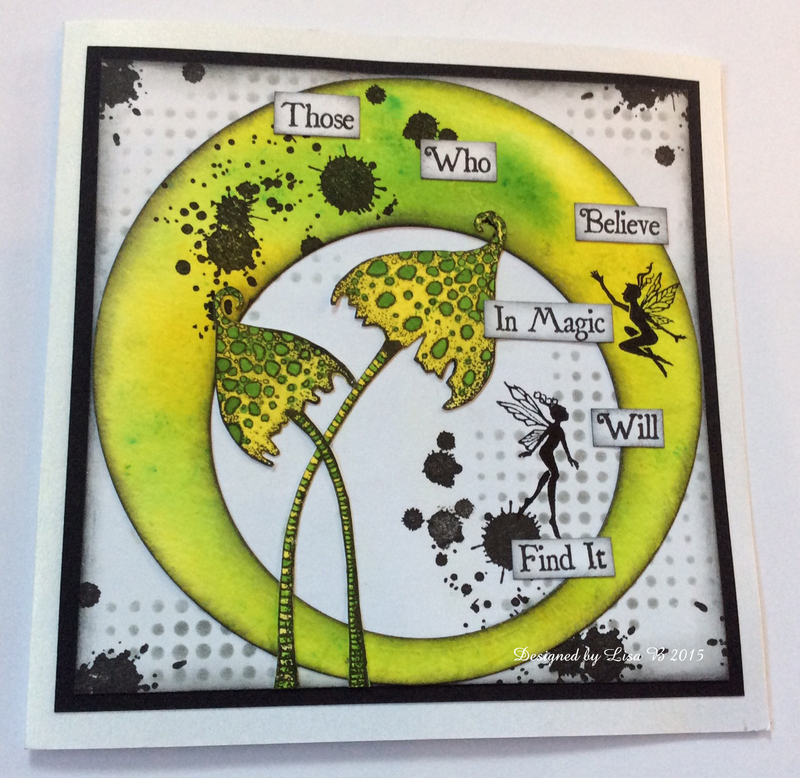 I then stamped some of the images again using the stonewash distress ink, (other distress inks are available on the website). More sparkle was added to the fairy wings using Stickles Diamond. Here's a couple of close ups and the Mirror again. How are we all today? Fed up with the wet stuff yet? We have certainly had a lot in Kent in the last few days! Sticking with a similar theme of these naughty little fairies throwing around paint splats I thought that I would create a background first so I took an Imagination Crafts Hexagons stencil and added some Hickory Smoke Distress Ink through it with a Blending Tool to add some texture to the background of a piece of white super smooth card, I also edged the square lightly with it too. 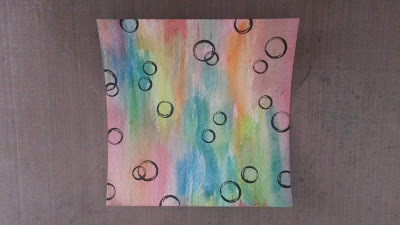 After laying out the pieces on the card, I decided I wanted to add two fairies, some bubbles and splats. So I attached the circle and mushrooms using Cosmic Shimmer Glue. Then I added some Lavinia Stamp Bubbles which I painted in with the brushos wash that I had left, I added two fairies from Lavinia Stamps Three Small Fairies stamp and some splats from IndigoBlu Ink Splats. 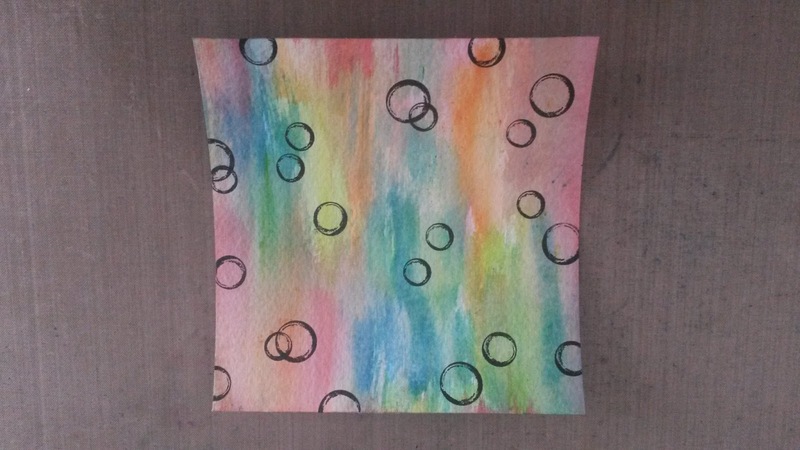 I stamped the Lavinia Bubbles with Onyx Black Versafine & painted them with yellow Brusho. 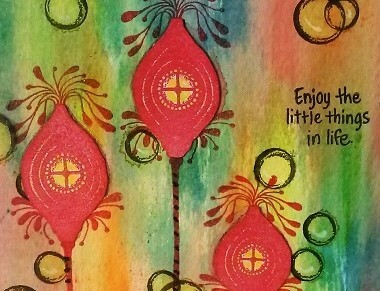 I finished the card with a quote from the Stampendous 'Life Words' set. Thanks for visiting the blog today. See you next time.